Vietnam registered a trade deficit of US$768m in February due to negative growth of 3.3% in exports. An upswing in domestic manufacturing compensated for the setback in electronics production. Manufacturing activity was still strong, posting a growth of 12.4% yoy in 1Q19. A slowdown in external demand has dented electronic manufacturing activity as electronics output only recorded a slight increase of 2.9% yoy in 1Q19 vs. 29.3% in 1Q18. However, the uplift from other manufacturing sectors (refinery products [+96.1% yoy], metal [+37.3%] and motor vehicle [+20.8%]) helped to offset the impact of the weaker contribution from electronics manufacturing growth. As FDI manufacturing growth trends lower, domestic investment could be the driving force behind the expansion of manufacturing sector in 2019. In 1Q19, the mining sector continued to contract albeit at a slower pace (-2.2% yoy vs. – 3.7% in 4Q18 and 1.0% in 1Q18). Meanwhile, agricultural sector growth eased to 2.7% yoy (vs. 3.9% in 4Q18 and 4.3% in 1Q18) due to lower output and unfavourable prices. 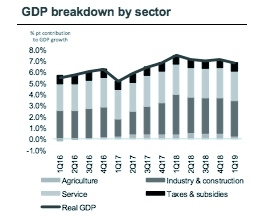 In contrast, services activity remained largely steady, rising 6.5% yoy (vs. 6.6% in 1Q18), supported by resilient domestic demand and still robust growth in the banking and real estate sectors. In 1Q19, the banking and real estate sectors grew by 7.7% yoy and 4.8% yoy, respectively (vs. 7.7% and 3.6% in 1Q18). As we expected, a sharp drop in pork prices helped to mitigate inflationary pressure arising from increasing fuel prices in March. Specifically, food inflation was down by 1.42% mom while transport inflation was up by 2.22% mom. As weight for food in the CPI basket is higher than that for transport, CPI fell 0.21% mom in Mar 2019, helping inflation stay muted in 1Q19 at an average of 2.63% yoy – the lowest level seen in 1Q of the last three years. The electricity price hike on Mar 20 may exert some inflationary pressure, but is unlikely to result in further inflation risk, in our view. 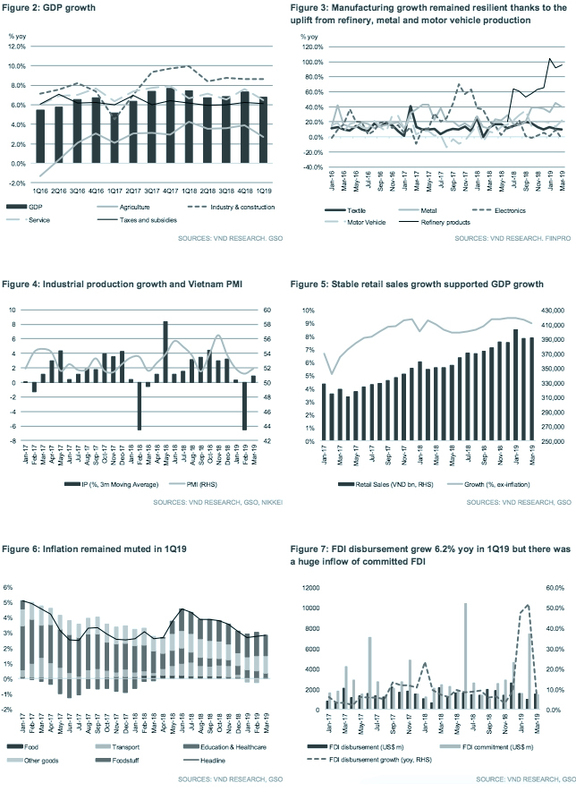 We expect GDP growth to moderate in subsequent quarters this year as: 1) the effects of the launch of Nghi Son Refinery in May 2018, which boosted refinery production and manufacturing growth in 1Q19, could fade in the upcoming quarters; and 2) it will take time for the impact of a shift in manufacturing capacity into Vietnam, as a result of the US-China trade war, to translate to economic growth. In the meantime, a slowdown in the FDI sector could dampen both exports and economic growth in the near term. As such, we maintain our 2019 GDP growth forecast at 6.6% despite the impressive growth in 1Q. Originally published by CIMB Research and Economics on 5 April 2019.